Will the Internet Of Things (IOT) make its biggest mark in industry ahead of the home? Rory Cellan-Jones presents. Will the Internet Of Things (IOT) make its biggest mark in industry ahead of the home? We talk to Ron Zink of John Deere about self-driving tractors, and Nigel Hill of Umbra Shading about connected window blinds. Plus Irene Ng of the HATDeX project tells us about the possibility of using our personal data to get discounts in stores. With special guests professor Andy Stanford-Clark, IOT expert and Master Inventor at IBM, and Jeni Tennison, technical director of the Open Data Institute. Presented by Rory Cellan-Jones. 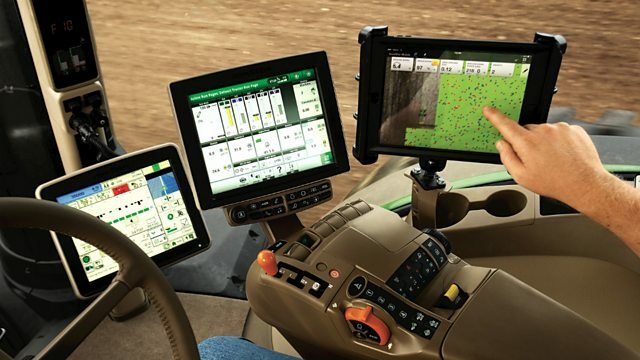 (Photo: Automated tractor cab, Credit: John Deere). Driverless Cars On Collision Course?